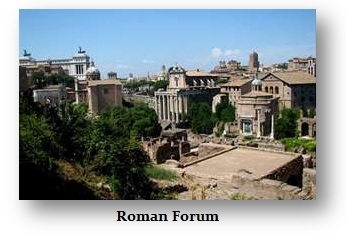 It is told that Rome was founded by Romulus and Remus in about 753 BC. Roman tradition held that the first Romans migrated to Italy following the fall of Troy. If so, the Roman’s would appear to have lost most of their culture and artistic skills. It is perhaps more likely that they were a native people living in the shaddow of the Etruscans. Archaeologial evidence suggests that their origins are very ancient. The Romans appears to have settled on the east bank of the Tiber at least back to the 8th century BC. Rome was at first dominated by the more advanced society known as the Etruscans until the 6th century. Rome was at first a city ruled by Kings. Pliny tells us that the birth of the monetary system took place during the period of the kings Servius, Tulles and Numa. Pliny quotes an earlier source (Timaeus of Tauromenium) in which irregular lumps of bronze circulated as money, which he called Aes Rude. During this primitive period of the Roman monetary system, the base currency was indeed bronze which traded according to weight. Examples of Pliny’s odd lumps have survived. Indeed, these lumps of bronze range from a 8 to 300 grammes in weight. There were no marks of value nor was there any standardization. The metals simply traded purely by weight. The first standardized monetary system begins to emerge in Rome during the late 4th century BC. Oblong bricks of bronze begin to appear in circulation along with the Aes Rude. Crude designs are employed for the first time and there also appear to be small divisions. 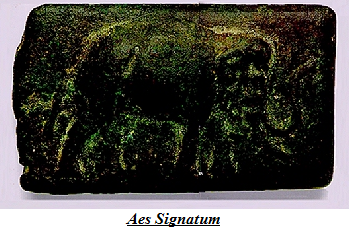 These primitive bronze bricks are called Aes Signatum. 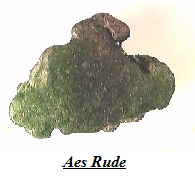 This early primitive Aes Signatum range in weight from 3500 grammes down to 440. By the early 3rd century BC, the Aes Signatum developed into greater standardization and an improvement in design showing some Hellenistic influence in the high reliefs. It is during this period where we even see an Ox as the design again referring to Oxen as currency. This is also evident in the linguistics as the word for cattle is “pecus” and the word for money becomes “pecunia.” By 290 BC, Rome had conquered central Italy by. Over the next two decades, Rome became exposed to the political intrigues of South Italy. It is during this period that the designs of the Aes Signatum begin to take on a military motif in addition to adding the inscriptions “ROM” or “ROMANOM” (of the Romans). Here we find a design of an elephant on the obverse and the reverse a sow. This design directly related to a military victory where Pyrrhus, along with his Greek allies, invade Italy with Indian elephants that are turned back by the stench of Rome’s pigs at the battle of Beneventum in 274 BC. 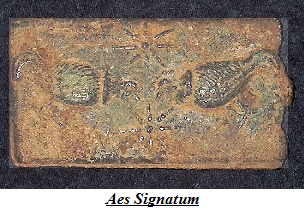 The average weight of the Aes Signatum bars during the 290-240 BC period is 1500 gms or about 5 Roman pounds. These ingots may have been a Quincusses or 5 roman Aes. By 290 BC, a monetary system emerged in Rome providing a full complement of denominations. These new standardized bronze denominations are known as “Aes Grave” and begin to form a monetary system that to this day still influences modern society. We do know that a slave was worth about 10,000 asses or about the same cost of a horse. Someone who possessed 100,000 asses was among the highest rank within society while someone with a net worth of less than 15,000 asses belonged to the poor or “proletarius” who were the lowest rank among the citizenry, according to Dionysius of Halicarnassus – Antiquities of Rome. For the most part, the early period of Rome was a self-contained society showing little need to trade with the world beyond Italy. For this reason, the Roman monetary system was still in a barbaric state considering the fact that in Greece, coinage had become a work of art. Nonetheless, Rome had been exposed to the world thanks to Pyrrhus and found herself on the edge of Greek influence. Her monetary system suddenly began to reflect this new self awareness and for the first time silver made its way into the “official” list of Roman denominations. Around 280 BC Rome began to respond to the Greek influence. It is here where we find that Rome actually began striking silver coinage utilizing the same methods as those employed in the Greek world. 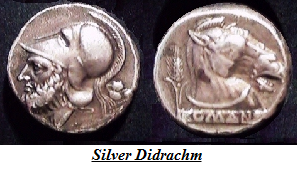 The weight standard adopted in Rome was that of the didrachm (7 gms) with a design which also reflected Rome’s self-image. The obverse boldly displayed the god of war – Mars. He faced left wearing a helmet. The reverse displayed a horse head facing right with a tablet below on which was inscribed “ROMANO.” This new silver denomination was referred to as a “triummus” by Plautus suggesting its value being 3 Roman bronze As. At a full bronze weight for the As, this would put the bronze to silver ratio at about 120 to 1. Between 275-270 BC, the god of war, Mars, gave way to the image of Apollo. The reverse displayed a horse galloping. At near the same time, two small struck bronze coins appeared – Double Litra and Litra. We can see by the illustration here of a bronze litrae, that the art of the greek world was gradually making its effects felt upon the Roman monetary system both in weight as well as design. The bronze standard appears to have begun a gradual decline no doubt as a result of the great expense of the First Punic War between 264-242 BC (Rome vs Carthage). The As had declined in weight from 400 gms around 289 BC to about 300 gms at the time of the First Punic War. By 240 BC, the weight of the As declined even further to about 220 gms – or nearly a 50% reduction. Uncia…….. Head of Bellona:___ 1 pellet. The replacement of the Greek style didrachms with the distinctly Roman quadrigati, bearing a janiform head of the Dioscuri on the obverse, marked the beginning of debasement policies and inflation that would become a recurring story throughout Roman history. Clearly, the demand for precious metals was indeed rising during this period. As inflationary trends continued during this period, the quadrigatus experienced a noted and steady debasement. By the end of the Second Punic War, the quadrigatus hardly appeared to be silver at all but rather much more dull due to the major debasement. It was during the monetary reform of 225 that also introduced gold to the Roman list of denominations for the first time. This gold stater incorporates the familiar Roman Janiform while the reverse was made up of an oath taking scene. These gold issues were extremely rare and did not make up an everyday circulating currency. Rather, these gold staters were used for very large transactions only. The economic crisis of the Second Punic War (218-201 AD) was responsible for a complete restructuring of the Roman monetary system towards the close of the 3rd century BC. The Hannibalic invasion (217-216 BC) created a virtual siege mentality throughout Italy and this is clearly reflected in the coinage record of the time. The cast bronze Aes Grave coinage underwent a very rapid series of drastic weight reductions during this period falling from 140 grms to as far as 41 grms. For the first time, we also see three very large new denominations emerge – decussis (10 As 1106-652 grms), Tressis (3 As 313-208 grms) and the Dupondius (2 As 221-134 grms). All three of these denominations also experienced severe declining weight standards. The scarcity of these later issues among surviving specimens reflects the reality of Gresham’s Law. The drastic weight reductions prompted massive hoarding of earlier issues thus working in reverse for collectors in modern times as larger quantities of heavier weights have survived than of the later crisis issues of lessor weight. 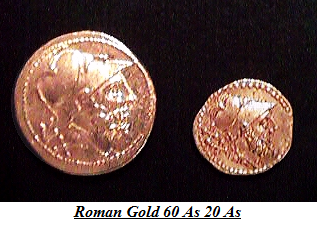 Eventually, the collapse of the bronze monetary system became evident as the old cast Aes Grave series was completely replaced by a bronze coinage of a significantly lessor weight struck from dies rather than cast from molds by circa 211 BC. This monetary reform of the Second Punic War, which took place between 213-211 BC, is known as the “sextanal” standard. It was during this period that the weight of the Roman As fell to about 48 gms – down from 400 gms at the beginning of the century. The silver quadrigatus had also reflected the severe monetary crisis of the period. Here we find that the silver coinage had undergone its own debasement. The quadrigatus fell significantly in silver content, quality and even design style. The inflationary pressures had been reflected in the silver coinage to such an extent that it too had to be abandoned in circa 211 BC. Therefore, what emerged from the Second Punic War was a completely new monetary standard. The abandonment of the silver quadrigatus thus took place and the birth of a new, lighter coin, the denarius, emerged – tariffed at 10 asses. The weight of the Roman denarius was henceforth established at 4 gms of silver approximately 98% pure. This denomination was clearly marked with the numeral “X” clearly displaying its value being equal to 10 Roman Ases. A half denomination was also issued known as the “quinarius” displaying a value of “V” – 5 Roman Ases. Despite the collapse in the bronze monetary system, it is important to note that the denarius and its fractions were still being valued in terms of the underlying bronze coinage. A third denomination in silver was also eventually added, but remained very unpopular. This was the tiny silver sesterius equal to 3 Ases. This monetary reform, which gave birth to the silver denarius, thus created a unit of monetary value that would stand for centuries. Its silver content became exceptionally stable and indeed, the 98% purity remained in effect for the most part even into the reign of Augustus (27BC-14AD). As Rome prospered, it would be the denarius that would eventually become the unit of value on an international scale. And its name, would live well into modern times becoming denier, denaro and penny in the English language. 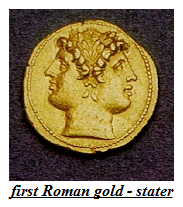 The monetary reform of the Second Punic War also led to the introduction of a new issue of gold coinage utilizing once again the portrait of Mars helmeted. Here too, there were marks of value in Roman numerals and again the marks still referred to the number of bronze Roman As either 60, 40 or 20 as its equivalent. 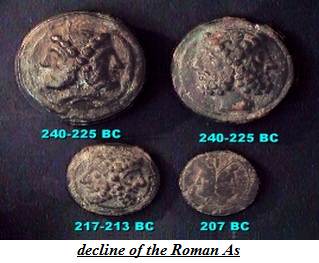 Therefore, the sextanal standard may have broadened the denominations within the monetary system of Rome but it continued to reflect a basic unit of value as the Roman As despite its significant reduction in weight during that century. Despite the fact that Rome abandoned the Greek silver didrachm standard in favor of its own lighter weight denarius, the dominance of Rome internationally had not yet been achieved. Rome thus quickly learned the lesson of foreign exchange. Therefore, another denomination also appeared in silver along with the denarius during this monetary reform. This new denomination was known as the “victoriatus” with a weight of about 3 grms. This denomination did not fit within the Roman monetary system itself by any weight standard. The significance of this denomination lies not within domestic Roman society, but within Rome’s international contact with the outside Greek world. 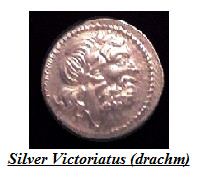 The victoriatus was equivalent to a Greek drachm. This meant that the denarius was at a substandard from an international perspective of foreign commerce which had largely been conducted in didrachms. In order to facilitate trade, Rome needed a monetary unit that would provide an acceptable currency for foreign exchange purposes. Based upon hoard evidence, the vast majority of the victoroatii have been found in the regions north of the Po – namely Cisalpine Gaul. One important economic trend that becomes clear here is what one might call the Law of Value. In other words, the further one travels from the main economic activity level, the greater the purchasing power of the standard unit of account. Thus, the didrachm’s value tended to increase in purchasing power the further one traveled from Greece so that by the time you reached Cisalpine Gaul, the purchasing power equivalent of the didrachm became its half-denomination, the drachm. This Law of Value holds true in modern times as well. The most expensive cost of living tends to be in the dominant regions of commerce. Thus, a home outside of London or New York costs less than one located in the city. The further one travels from the city the greater the purchasing power of the standard unit of account becomes. Therefore, the cost to feed one child in New York becomes the cost of feeding 20 children in South America or Africa. The same Law of Value thus held true in ancient times as it does today in modern times. The appearance of the victoriatus at this point in the Roman monetary system also illustrates an age-old problem of domestic versus international trade which still remains a key economic issue today. This denomination thus created a two-tier monetary system whereby the denarius was acceptable domestically and the victoriatus was used in international trade where the monetary standards had been greatly influenced by the Greek world. Such two-tier monetary systems have appeared throughout history including the trade dollars issued by the United States and Great Britain during the 19th century. Later, about 141 B.C., the denarius was retariffed at 16 asses, a value which it retained into the Imperial period. The denarius was destined to be the principal denomination of both the Republican and the Imperial monetary systems, up to the mid-3rd century A.O. Also in 211 B.C. the silver quinarius (half denarius) and sestertius (quarter denarius) were introduced, but these denominations were never issued on a regular basis. The picture is completed by the silver victoriatus, a Coin somewhat lighter than the denarius, and doubtless intended to facilitate trade with the Greek communities in the south. With the expansion of Rome’s horizons following victory in the Second Punic War the victoriatus was abruptly discontinued. The inflation persisted and after 80 B.C. bronze coinage was driven completely out of circulation except from a brief issue under Julius Caesar. It is with Augustus that we find a complete revision of the monetary system of Rome where bronze coinage was finally reintroduced. Augustus kept the minting of gold and silver under his exclusive control while the bronze coinage authority was given to the Senate in 23 B.C. which is evidence by the markings “SC” meaning Senatue Consulto. Uncia Head of Hellona: 1 pellet. Gold Coins were very seldom issued and formed no part of the regular Coinage in the Republican period. They were struck for military and similar emergency purposes, and all types are now rare. In the period of civil strife which followed the assassination of Julius Caesar, gold was issued by and for the various contestants: such a coin is illustrated above, being an aureus bearing the name and portrait of Brutus and struck, as the Coin tells us, by Cassius Longus, the “envious Cassius” of Shakespeare’s play. No Republican bronze was issued after about 84 B.c., except for a brief emission under Julius Caesar, but as soon as Augustus had achieved supreme power and restored peace to the Roman world, he resumed the regular issue of aes as part of his re-organization of the coinage. The minting of gold and silver he kept under his own control, but the copper and orichalcum coins were issued by the Senate, and bear the letters S.C. (“Senatus Consulto”) as evidence of this. These Senatorial coins begin about 18 B.c., and at first the names of the responsible moneyers form part of the legends, but not after 4 B.C. The dupondius and as, though of similar size, could be distinguished by the colour of the metal yellow orichalcum, red copper. the radiate head of the emperor only coming into use as 5 regular feature of the former coin at a later date. At certain Asiatic mints Augustus and his successors continued to strike the large silver pieces, equal to three denarii, which are usually termed cistophori or tetradrachms. Coins of this size and value, bearing as one type the “citta mystics” from which the name derives, had been the chief coinage of Asia Minor from the 2nd century B.C., and although in the Imperial period the types were more in accordance with the general style of Roman issues, the coin was substantially the same and readily passed current. The emperor Nero, who with all his faults was a man of considerable artistic talent, took an interest in the Imperial coinage which led him to institute an as and a quadrans struck in orichalcum in addition to those of Copper. Whether his ultimate intention was to discard copper altogether is not certain, but in any case these pieces did not survive his own reign, with certain small exceptions such as the orichalcum asses struck by Trajan and Hadrian. The sestersces of the first and second centuries A.D. are amongst the most attractive of all the Roman series, bearing interesting types very often most artistically portrayed. These coins, when in the finest condition, are much sought after and always realize high prices. The asses and dupondii also, though their smaller flans do not give the scope offered by the larger denomination, are often beautiful examples of the engraver’s art. Nero lowered the weight of the gold and silver coins and reduced the fineness of the latter. Successive emperors, always pressed for money, carried on the evil process, until by the reign of Caracalla the denarius was barely 40% of silver. This emperor further debased the coinage by introducing a new Coin of similar metal which, although only equal in weight to I ~ denani, was probably tariffed as being the equivalent of two. The new piece, which we know by the name antoninianus (after Caracalla’s official name, Antoninus), always shows the emperor wearing a radiate crown, as opposed to the laurel-wreath of the denarius. In the case of empresses, this denomination is distinguished by a crescent placed beneath the bust. The antoninianus, which drove the denarius out of circulation towards the middle of the third Century, became more and more debased until, by the reign of Gallienus, it was reduced to a mere copper or bronze piece, often of very small module, with a slight silvery wash. Aurelian, in his reform of the Coinage, restored the antoninus to some thing like its original size, but did little to improve its silver content. The antoniniani of Claudius Gothicus, and of the Gallic usurpers Tetricus Senior and Junior, were largely imitated by unofficial mints, and these contemporary forgeries are frequently found in British hoards. Although sometimes reasonably good copies of the originals, many of them are grotesque in the extreme as well as being much smaller than the officially minted coins. 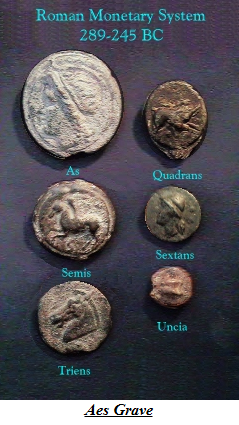 To this class of coin the name ~~barbarous radiate” has been given, and the exact dating of the variOuS types and classes is still a matter of dispute. Thus the Imperial coinage was reduced to a very low-level, except for the gold which continued to be of fine quality although fluctuating in weight. The sestertius, dupondius and as were issued more or less regularly, but fell Out of use when the antoninianus became itself little more than a bronze coin. The last sestertii of the old style were issued by Postumus, who also struck the two lower denominations. An innovation by Trajan Decius (A.D. 249-251) was the double sestertius bearing a radiate bust. This fine piece, which is actually very little heavier than the sestertii of the early emperors, is rare, and was not continued by the Successors of Decius. important of these changes were the introductions of two new denominations, the argenteus, a silver coin of approximately the same fitness and weight as the denarii of Nero, and the follis, a coin of silver-washed bronze resembling the as of the earlier empire. The issue of the antoninianus was discontinued, but a similar coin was still struck for about a decade following the reform. This piece was of the same size as the antoninianus and had the familiar radiate crown on the obverse, but it no longer bore the mark XXI on the reverse and it contained no trace of silver. These Coins are referred to in this catalogue as post-reform radiates. Constantine the Great made further changes in the monetary system. In place of the aureus (1/60 lb. of gold) he introduced a new coin called the solidus which was struck at 72 to the lb. The solidus, which was first struck about 310, soon superseded the aureus as the standard gold coin of the Empire. Other gold denominations introduced by Constantine were the semissis (half solidus) and the 1 1/2 Scripulum (Nine Siliquae). Later in his reign, Constantine resumed the issue of silver coins, which appears to have almost ceased after the large output under the Tetrarchy. There were two main denominations in this metal, the miliarense (1/14 solidus) and the siliqua (1/24th solidus). The latter was of the same weight as Diocletian’s argenteus (1/96 lb. of silver) but Con stantius II reduced its weight to 1/144 lb. 2% ceo renionalis of Constans. The bronze coinage of the fourth century presents many problems. The follis soon began to decline in size and weight and this process was allowed to cOntinue for nearly half a century until, by the time of Constantius II and Constans, the only bronze coins in issue were tiny pieces of about 15 mm. diameter and about 1.65 grammes weight. As the standard of the bronze coinage was thus continuously changing, it is very difficult to establish its relationship to the gold and silver denominations. In 348 AD, Constantius II and Constans introduced a heavier coin called the cenrenionalis, and later emperors also made attempts to restore the bronze coinage. Magnentius (350-353) and Julian 11(360-363) both struck very large pieces (c. 30 mm.) and Gratian (367-383) introduced a coin closely resembling the centenionalis. However, all these attempts were comparatively short-lived, and after the death of Theodosius I in 395 AD, only the small bronze denominations continued in regular issue. 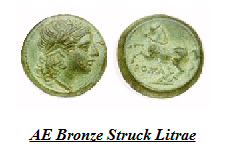 As so little is known about the names of the denominations of the late Roman bronze coinage, they are usually referred to as 2% 1, 2% 2, 2% 3 or 2% 4, 2% 1 being the largest. The coinage of the fifth century consisted mainly of the solidus and the two smaller gold denominations, the semissis (A solidus) and the tremissis (A solidus). The tremissis had been introduced by Theodosius I to replace the 1,1 scripulum of Constantine’s system. Very little silver was issued and the bronze, which was mostly of the tiny 2% 4 module, was only struck in comparatively small quantities. The shortage of officially minted coins was to some extent made good by another vast output of barbarous imitations, many of them copies of the centenionales of Constantius II. In 498 AD, Anastasius I introduced a new series of bronze coins of a completely revolutionary type, each denomination bearing its mark of value conspicuously on the reverse. As the introduction of these coins marks an almost complete break with the traditions of the Roman coinage, the reform of 498 AD is a convenient point at which to begin the Byzantine series, at least as far as the bronze is concerned. Pingback: Huabei Lifting Hook Co.,Ltd. Pingback: Chengdu Guide International Trade Co., Ltd.